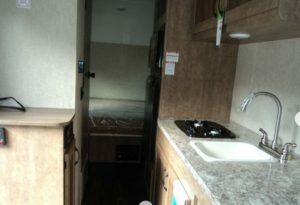 Are you looking for the newest thing in lightweight travel trailers that combines “tiny home” concepts without sacrificing top notch amenities? 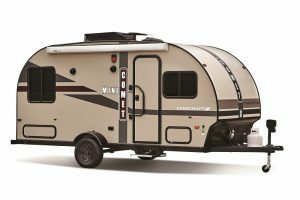 If so, then you may want to check out the new Starcraft Comet Mini which features 5 models in this product line. The Comet Mini’s standard features include convection microwave, upgraded pleated nightshades and an optional 13,500 BTU air conditioning. Exterior features include an electric awning, electric tongue jack and bumper mount grill. Not all lightweight travel trailers available on the market have these features so check this out. This model is about 16 feet long so it can fit in nearly any tight space. The tear-drop inspired design utilizes lightweight materials throughout making this an easy and fun trailer to tow. 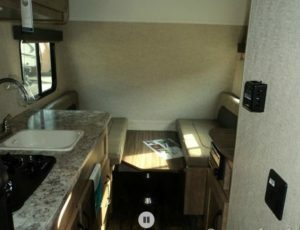 Our pictures show the 16 RB that has a large booth dinette in the front that converts to a bed. There is a queen sized bed in the rear. 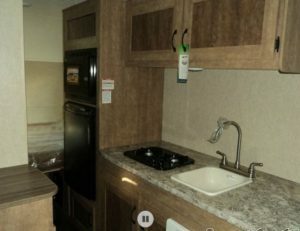 In the center of the trailer is the galley with ample counter space, convection oven, range, sink and more. The private bathroom and shower area will eliminate the need to make that midnight walk to the bath house. Are you looking for lightweight travel trailers to get your family out of the city and into nature? If so, check this out. Your family will enjoy the long family hikes, afternoon swims in watering holes, and s’mores at the campfire. And if you have a travel trailer that needs some repairs before you take it on the road give Fix My RV a call. We’ll get your repairs done and get you and your family on the road again. For a list of the systems we work on click here. Call us at 623-875-5015. A special thanks to our friends at RV Pro who shared this press release information in their August publication. To view click here: RV Pro August 2017 Starcraft Mini.